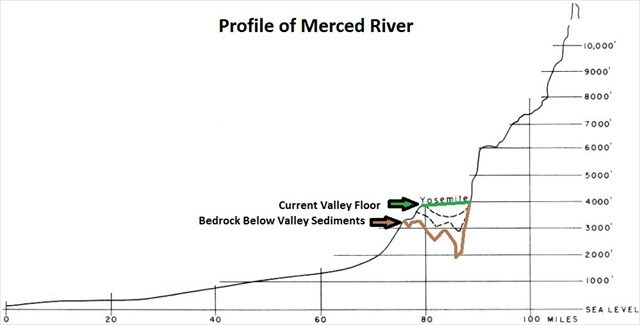 Glacial moraines of various ages must have blocked the Merced River periodically creating Lake Yosemite. Sediments deposited in the lake filled Yosemite Valley with up to 2,000 feet of sediment. The El Capitan Moraine is the most recent. Please keep trash with you at all times, do not leave it behind in these pristine places. Bury human waste 6 inches deep, make certain you are at least 50 paces away from any water source and PLEASE bring your toilet paper and sanitary items back out with you. Keep food and all scented items on your person at all times. Support wildlife by allowing them to find their own food, do not feed them. Allow plants to grow and water to stay clean by staying on trails, bike paths and roads. There is a small parking area parallel to the one way road. If you choose to cross the road be careful of the traffic. Yosemite Valley is often described as a typical glacial valley. But where is the typical “U’ shaped valley that is used to identify a glacially cut valley? (See Tuolumne River Glacial Valley Geomorphology). To find that shape, we will have to explore the more recent geologic history of Yosemite Valley. Geologic studies have shown that glaciers have moved through Yosemite Valley during a number of glacial episodes. Between 2.5 million to 200,000 years ago about 36 different glacial episodes have been identified in the Yosemite area. All of these episodes are combined into what is called the Pre-Tahoe glaciations. 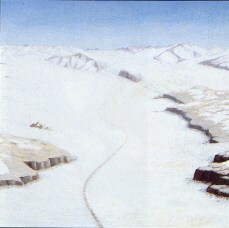 However, one episode, the Sherwin Glaciation is the most notable. It began between 900,000 and 800,000 years ago and lasted over 300,000 years. The valley was completely filled even extending a short way above the rim. The glacier extended as far as El Portal. However, Half Dome still stuck some 900 feet above the glacier. At that time the highest mountains were only about 9,500 feet above sea level. It was during the Sherwin glaciation that the majority of the erosion of Yosemite Valley is thought to have taken place. As the glaciers from the Tenaya and Merced Glaciers combined the thickness and velocity of the merged glacier gouged out a deep basin in the area of the Ahwahnee Hotel and Camp Curry. This basin is about 2,000 feet below the current valley floor. A second basin was gouged out near Cathedral Spires (about 1,000 feet below the valley floor) and a third smaller one near the Cascades. As the Merced Glacier began melting, its terminal moraine dammed the Merced River forming a lake in Yosemite Valley. Sediments from the glacial meltwater quickly filled in large basins the glaciers gouged in the granite bedrock. 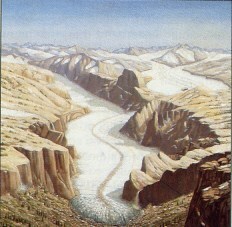 It is thought that flucutations in the advance and retreat of the Sherwin Aged Merced Glacier created at least two different lakes in the valley forming a flat valley floor. The more recent glaciations of Tahoe and Tioga age also formed glaciers that flowed through the valley. The thickness and extent of the Tahoe and Tioga glaciations were much smaller than the Sherwin Glaciation and did not have the erosive power to reexcavate the lake sediments deposited by the Sherwin aged Lakes. Thus at the end of the Tioga Glaciation (the most recent event where a glacier flowed through the valley) a terminal moraine was deposited on top of the prior lake sediments. The road cut provides a cross section of this terminal moraine. 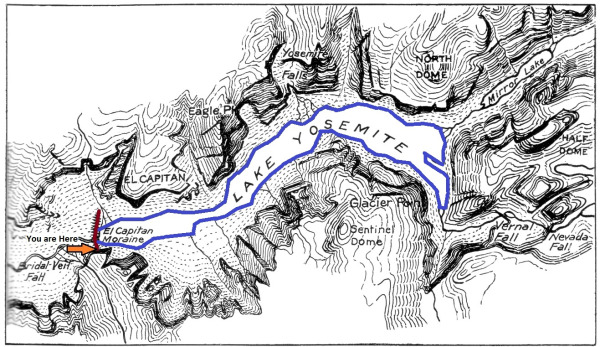 The El Capitan Moraine created a final Yosemite Lake. As before, this lake continued to fill the valley with sediment. 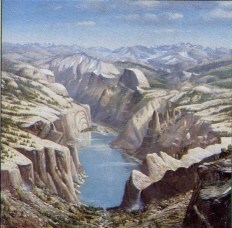 Prior to 1897, the lake had not fully filled, and Yosemite Valley was swampy and mosquito infested. Annual floods continued to fill in the valley much as Mirror Lake is currently being filled (Mirror Lake, Mirror Meadow - Which one is it?). In 1897, the El Capitan Moraine was dynamited to create a deeper channel though it. This allowed greater drainage of the valley, eliminating the swamps and causing the Merced river to erode down in its channel. The dryer valley has also allowed pines to begin to grow in the valley floor. The number of people in your group (put in the log as well). Describe the valley floor upriver and down river, how does the valley change? Examine the river channel and sides. What evidence of the dynamiting remains? Why is that so? How the depth and ages of the different incarnations of Lake Yosemite was determined. 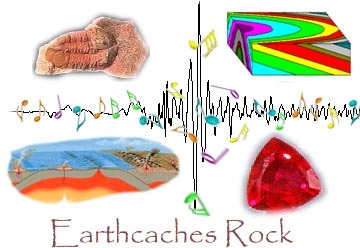 The depth and age of the sediments beneath the current valley floor were determined using seismic studies. Sound waves move at different speeds through material of different densities. Additionally, sound waves will reflect off of surfaces where materials of two different materials touch. By setting off controlled explosions and placing microphones at known distances, a three dimensional map of the subsurface can be created. This study was completed by BENO GUTENBERG JOHN P BUWALDA and ROBERT P SHARP in 1935 and 1937.